Director – Terence Fisher, Screenplay – John Elder [Anthony Hinds], Based on the Novel by Gaston Leroux, Producer – Anthony Hinds, Photography – Arthur Grant, Music – Edwin Astley, Makeup – Roy Ashton, Production Design – Bernard Robinson, Opera Scenes Staged by Dennis Maunder. Production Company – Hammer. As ‘Saint Joan’, the latest opera of the self-important Lord Ambrose d’Arcy, premieres at London’s Albany Theatre, everything starts to go wrong, culminating in a murdered body appearing on the stage. After his diva quits, d’Arcy auditions for a replacement. He hires Christine Charles after being taken by her beautiful singing voice. In her dressing room, Christina hears the voice of The Phantom that is reputed to haunt the theatre. The Phantom warns her that d’Arcy is vile and that he, The Phantom, will coach her so that she might sing for him. The Phantom is proven right soon after as the lecherous d’Arcy tries to have his way with Christine. The theatre’s director Harry Hunter becomes intrigued by The Phantom and follows clues that lead to the composer Professor Petrie who died in a fire at a printer’s shop. Harry realises that Petrie is The Phantom, that he survived the fire but with his face hideously scarred by acid, which forces him to hide behind a mask. Petire is determined to take revenge against d’Arcy for stealing ‘Saint Joan’, which was originally his composition. The Phantom then abducts Christine and takes her down to his lair under the theatre where her forces her to sing for him. This was the third film version made of Gaston Leroux’s The Phantom of the Opera (1909). The first and finest version had been the silent Universal version The Phantom of the Opera (1925) with Lon Chaney [Sr]. The 1925 version has a glorious Gothic feel to it that none of the other adaptations ever achieve. Universal had previously remade the film in sound and colour as Phantom of the Opera (1943) with Claude Rains, although this version lacked the greatness of its predecessor. This third version of the story came from England’s Hammer Films. (See bottom of the page for the other versions of The Phantom of the Opera). In the 1950s, Hammer Films had massive successes with The Curse of Frankenstein (1957) and Dracula/The Horror of Dracula (1958), both remaking the classic 1930s Universal films in colour. As a result, Hammer embarked on a series of remake of other classics. The next couple of years saw Hammer’s versions of The Mummy (1959) and The Two Faces of Dr Jekyll (1960). 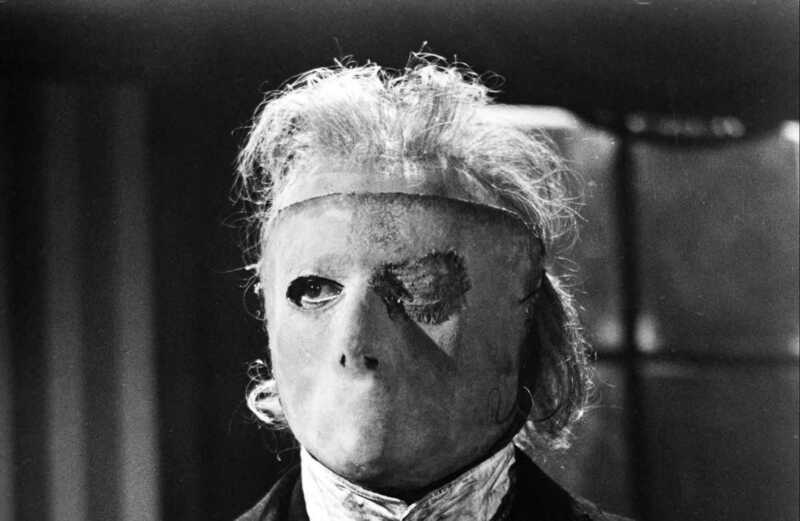 Unfortunately, when it came to remaking The Phantom of the Opera, Hammer’s star director Terence Fisher failed to fire the story up the way he had with their remakes of Frankenstein and Dracula and the film was not a huge success. Fisher was not happy with the way Hammer handled the film and left the studio for several years to direct elsewhere. It may simply be that The Phantom of the Opera suffered because it is one of the few early Hammer films that comes without the headline names of Christopher Lee or Peter Cushing (although it does have the second-rung name of Michael Gough). The troubles extend further than that though. Part of the problem seems to be the way that the Gaston Leroux story is reconceived to fit the cosy Englishness of the Hammer product. The story is noticeably transferred away from the evocative locale of the Paris Opera House to what is little more than a backstreet London repertory theatre. Unfortunately, The Phantom of the Opera is a story that inhabits the same sort of fantastic netherworld as Louis Feuillade’s serials, a world that seems far from the cosiness of Hammer with its emphasis on Victorian rationality and its irruption by repressed forces. Case in point being the love story, which is an integral element of all other adaptations of The Phantom of the Opera but has been all but excised here. 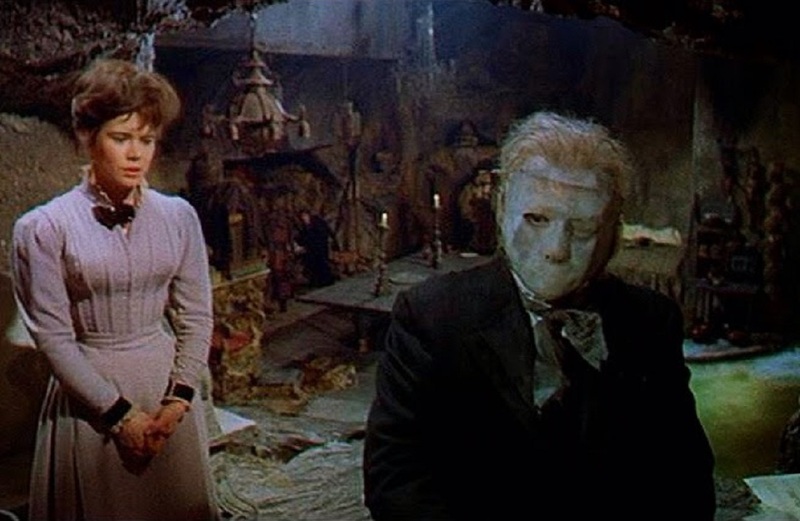 Maybe it was just English reserve at play but Hammer never seemed able to conduct the larger-than-life evocations of love that stories like The Phantom of the Opera dealt with, rather their films were concerned more with sexual repression. Terence Fisher does an okay job with the shocks – the build-up to the appearance of the body as the diva enters the stage is good, as is the killing of the rat catcher (played by no less than soon-to-be Doctor Who Patrick Troughton) signified only by the appearance of released rats. Nevertheless, The Phantom of the Opera is lesser Terence Fisher. It is noticeably lacking in the grandeur and visual flair that lit up many of his other works of the era. The opera of Saint Joan is a horridly ponderous affair. The set for the Phantom’s lair is good but those for the opera house make it look like a dreary suburban stage company. If Fisher had the production values of the 1943 version available to him, he could have made a classic. Like the 1943 version, this version also bungles the character of the Phantom. Herbert Lom’s Phantom certainly comes across as more of a madman than Claude Rains’s neurotic pipsqueak in the 1943 version but is still a far cry from Lon Chaney’s classic portrait in the 1925 version. Indeed, Michael Gough’s egomaniacal theatre director is more of a villain than the Phantom ever is. The most bizarre aspect is the ending, which seems at odds as to what to do with The Phantom – whether to treat him as madman or misunderstood – and how to wrap up the story. The film abruptly cuts from Edward de Souza confronting the Phantom in his lair to Heather Sears’ first appearance on stage and Herbert Lom’s Phantom waiting in his box, before abruptly winding the story up by having Lom impaled by a falling chandelier as he tries to prevent her being injured. Nor is Michael Gough – the real villain of the piece – ever allowed any scene where he gets his due. Other versions of The Phantom of the Opera are:– The Phantom of the Opera (1925), the finest version of all starring Lon Chaney; Phantom of the Opera (1943) starring Claude Rains; Phantom of the Opera (1983), a tv movie starring Maximillian Schell; The Phantom of the Opera (1989), a slasher film starring Robert Englund, which involved time travel and had The Phantom selling his soul to The Devil; The Phantom of the Opera (1990), a tv mini-series starring Charles Dance; The Phantom of the Opera (1998) from Italian director Dario Argento starring Julian Sands; and The Phantom of the Opera (2004) from the Lloyd Webber musical starring Gerard Butler. Other variations on the story are The Phantom of the Paradise (1974), a satirical version that sets the story to rock music; a pornographic version Phantom (1998); Angel of Music (2008) about a modern reporter conducting an investigation into the truth of the story; Phantom of the Theatre (2016), a Chinese version that conducts some radically different takes on the story; and modernisations like The Phantom of Hollywood (tv movie, 1974), The Phantom of the Ritz (1988), Phantom of the Mall: Eric’s Revenge (1989) and a Disney Channel children’s tv movie The Phantom of the Megaplex (2000), which had the Phantom haunting respectively a movie studio, a movie theatre, a mall and a cinema multiplex, as well as the low-budget The Phantom of the Opera (2014) where the Phantom’s spirit is disturbed by a reality tv crew. Terence Fisher’s other genre films are:– the sf films The Four-Sided Triangle (1953) and Spaceways (1953), The Curse of Frankenstein (1957), Dracula/The Horror of Dracula (1958), The Revenge of Frankenstein (1958), The Hound of the Baskervilles (1959), The Man Who Could Cheat Death (1959), The Mummy (1959), The Stranglers of Bombay (1959), The Brides of Dracula (1960), The Two Faces of Dr Jekyll (1960), The Curse of the Werewolf (1961), The Gorgon (1964), Dracula – Prince of Darkness (1966), Frankenstein Created Woman (1967), The Devil Rides Out/The Devil’s Bride (1968), Frankenstein Must Be Destroyed (1969) and Frankenstein and the Monster from Hell (1973), all for Hammer. Outside of Hammer, Fisher has made the Old Dark House comedy The Horror of It All (1964) and the alien invasion films The Earth Dies Screaming (1964), Island of Terror (1966) and Night of the Big Heat (1967).